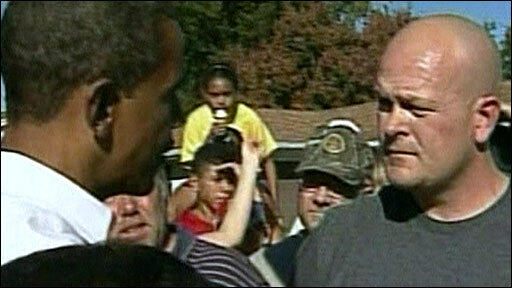 Doubt has been cast over the story of "Joe the plumber", the man who unexpectedly became the star of this week's US presidential debate. Joe Wurzelbacher, of Ohio, was thrown into the spotlight after he was used by John McCain as an example of who might suffer under Barack Obama's tax plans. Meanwhile, the two candidates traded jokes, not jibes, at a dinner a day after their final televised debate. Mr Obama and Mr McCain took to the stage in New York trading wisecracks about their campaigns, in light relief to the tense atmosphere of the debate the night before. Mr Obama retains a five-point lead over his Republican rival following Wednesday's third and final debate, according to the latest poll by Reuters/C-SPAN/Zogby on Friday. And the Washington Post newspaper has endorsed Barack Obama, saying he has shown the right characteristics needed to take the country through a time of great economic uncertainty. Joe Wurzelbacher, 34, found himself at the centre of a media frenzy on Thursday after "Joe the plumber" was mentioned 26 times during the final debate. A week earlier, he had confronted Mr Obama at a rally, questioning the Democratic candidate on tax plans that would see him taxed more if a plumbing business he hoped to buy earned more than $250,000 a year. He was held by Mr McCain in the debate as an example of an every day hard-working American who would be penalised by Mr Obama's tax policy. However, a bit of media digging has uncovered that Mr Wurzelbacher's first name is actually Samuel and he does not have a plumber's licence, although the company he works for does. According to Tony Herrera, of the Plumbers and Steamfitters Local 50 in Toledo, Ohio, Mr Wurzelbacher cannot practise in Toledo without a licence - although he can work for someone with a master's licence or in outlying areas that do not require a licence. Mr Wurzelbacher acknowledged he did not have a plumber's licence and admitted in one interview he was "not even close" to earning $250,000. At a fundraiser for Catholic charities on Thursday night, Mr McCain joked that he had replaced all his campaign advisers. 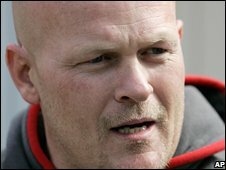 "All of their positions will now be held by a man named Joe the plumber," he said. He also made a jokey reference to Barack Obama's fierce rival for the Democratic candidacy, Hillary Clinton, who was also in the audience. "I can't shake the feeling that some people here are pulling for me. I'm delighted to see you here tonight Hillary," he said. Meanwhile, Barack Obama said he needed to correct some misconceptions about his background. "I was not born in a manger. I was actually born on Krypton and sent here by my father, Jor-el, to save the Planet Earth," he said, in a reference to Superman. He also listed his great strength as "my humility" and his greatest weakness as being "a little too awesome". The annual dinner has a tradition of presidential candidates as headline speakers before the election. Both men paid tribute to each other, with Mr Obama praising Mr McCain's service to his country as a former Navy pilot and prisoner of war in Vietnam. 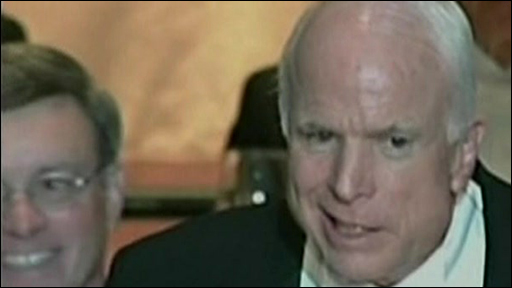 Mr McCain praised Mr Obama for his bid to become the first black president. "I can't wish my opponent luck but I do wish him well."